Welcome to another movie review, written by me specially for you. This time, it’s the review of Ant-Man – a film about the superhero with the weirdest name and also, a closing chapter of the Marvel Cinematic Universe’s 2nd phase. I hope you’ll like it! Enjoy! To begin with, you probably know that I am a huge Marvel fan, (my previous reviews of the Marvel films: Captain America, Guardians of the Galaxy, Avengers; thoughts on Phase 3), so I was extremely excited about the film. In short, for all of my fellow MCU fans, I would describe Ant-Man as a mash-up of the first Iron Man and Guardians of the Galaxy. For all of my mainstream readers, I would like to introduce this as a new and really cool version of Honey,I shrunk the kids with some superhero action and surprising amount of seriousness thrown into the mix. Either way, no matter how do I describe this film, it is irrelevant, because Marvel did it again – they made a solid film that pleases the hearts of the fans (mine included) and is enjoyable for the general public (my dad knew nothing about it and liked it a lot). 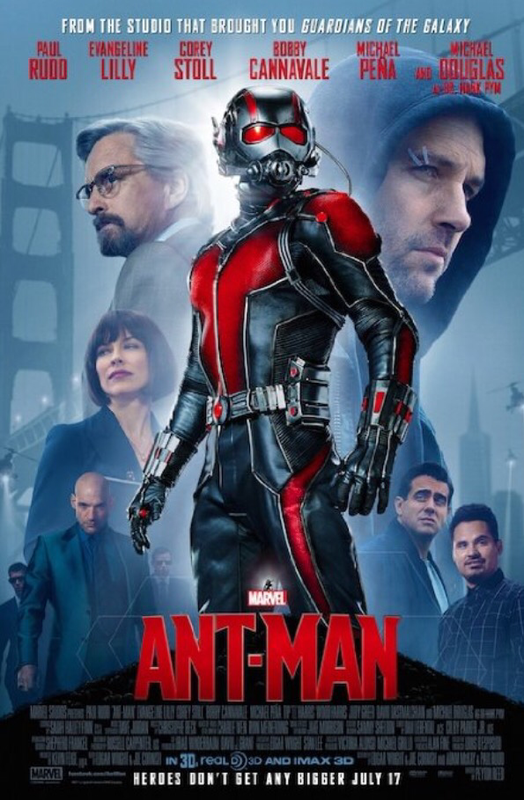 IMDb summary: Armed with a super-suit with the astonishing ability to shrink in scale but increase in strength, con-man Scott Lang must embrace his inner hero and help his mentor, Dr. Hank Pym, plan and pull off a heist that will save the world. Spoiler Warning – I advise you to watch the film first and then come back to the review. I will repeat the spoiler warning before talking about huge plot points. The name of the film suggests that it’s a movie for kids. However, Ant-Man surprises all of us because he is a sophisticated character. I believe that the name might target the film to a different audience that it’s actually meant for. I know one thing for sure: nobody will see this film in my country because the translated name sounds not only childish but stupid. Our world is ruled by social media, so it’s not a surprise that Hollywood secret don’t stay under locks for long. Probably all movie fans and just general internet users know that Edgar Wright spent a lot of time working on the script of the film and he was set to direct it. However, due to creative differences, he left the project and Peyton Reed stepped in as a director. I don’t want to speak negatively about Wright, but I believe that he should have fought for the project or found ways to reach a compromise if he was really passionate about it. His original screenplay is still used in the film with some minor tweaks and he receives the story and screenplay credits, which is nice. Speaking about directing, I don’t know if Wright would have done a better job, because I really liked what Reed did as well. I always try to allow the work to speak for itself, so, before going to see this film, I didn’t want to let these controversies form my judgement. And you shouldn’t give any influential power to gossip as well. This is the first film in a long time, which introduces a new character to the MCU in its own stand-alone film. I believe it was 2011 when we got the last stand-alone film of the MCU – the first Captain America. Granted, Guardians of the Galaxy were also new characters in a separate film, but they were still treated as a team and we didn’t have time to get to know all the them well. Ant-Man is a start of a stand-alone trilogy (probably), which can work on its own but is a great addition to the MCU as well. The first scene of the film not only explains why the Avengers couldn’t be called for help, but also allows Ant-Man to fit in perfectly with the overall arc of MCU. SPOILERS. It was really nice to see John Slattery back as Howard Stark and Hayley Atwell as Peggy Carter. Furthermore, the feud between Howard Stark and Hank Pym sets everything in motion flawlessly. Plus, I liked that they found ways to include Hydra and Shield into the plot. The visuals of the movie are stunning. Ant-Man’s powers are really well realized. And the way they used the ants in action scenes was wonderful. I didn’t even know that there were so many different species of ants and that they could do such things. The first 30 minutes are a bit slow, but the 2nd half of the film has non-stop action, so the work of animators and editors can definitely be seen there in all of its glory. Moreover, while the movie has a weird and funny premise, the shrinking scenes looked were grounded and realistic. You could actually believe that something like that could be happening in, for example, your neighbors house. The CGI work is really really impeccable. I cannot praise it enough. My favorite scenes were SPOILERS the ones in the subatomic level. That whole ‘outside of reality’ type of a world was extremely cool and pleasing for the eyes. As with all superhero films, this one had a training montage as well. This was, however, probably one of the best training montages I have ever seen. It was funny and serious, it felt like the training was useful for the character and that he really had time to grow as a hero. Also, that montage was quite long, so the training didn’t feel rushed, which happens a lot in other films. We knew that somebody from the Avengers team was going to shown up in the film. I wasn’t really surprised that it was Falcon because he isn’t an A-list Avenger (although, he might be one day, if he is the one who picks up the shield). Moreover, the appearance of Falcon (Anthony Mackie) set up the after credits scene were nicely. I think it is safe to assume that if Ant-Man shows up in Civil War, he will be on Cap’s team. Moreover, we cannot forget that Hank Pym hates The Starks, so he wouldn’t allow Scott to pick Tony’s side. Lastly, we had a chance to see the new Avengers base some more, because we only spent a few minutes there during the Age of Ultron. Also, keep your eyes peeled for Stan Lee cameo because it’s very short. Siri, of all things, has a very funny cameo/reference as well. Evangeline Lilly as Hope van Dyne was also really great. I really liked Lily in the Hobbit films when practically nobody liked her there, but I hope that with this film, the people will finally realize what a great actress she is. I will talk more about her in the end (credits). Also, the way they handled the inevitable falling in love moment between the two leads was amazing. I laughed a lot. Michael Douglas as Hank Pym was perfection at its finest. It was interesting and refreshing to see a Marvel movie focusing a lot on a more mature and more sophisticated character as well as seeing Marvel Studios casting a seasoned and well accomplished actor in the role. They usually prefer “growing” their own actors. Corey Stoll as Darren Cross / Yellowjacket was a cool villain. Personally, I believe that Marvel villains are getting better with each film. Yellowjacket was smart, he had a personal connection to our heroes, he had a cool costume and was ruthless with a dash of craziness. What more could you want form a villain? Michael Peña as Luis was the comedy gold of this film. His scenes and explanations were amazing, especially the matching lip movements and the words. I want to recreate his style of talking with my friends just to confuse them. Also, their whole heist was really funny and had wonderful jokes. ” Back it up, back it up, we are backing up!!”. Bobby Cannavale as Paxton (Scott’s ex-wife’s new boyfriend who is also a policeman) – was the only character which I felt was irrelevant in the beginning. He was just there to anger Scott and the audience. Granted, he became more useful in the end, but I still believe we would have been perfectly fine without him. The film main theme is family dynamics. They explored father-daughter (Hank and Hope; Scoot with his daughter) and father-son (Hank and Scott, Hank and Darren) relationships. Furthermore, ideas like ‘jealousy in the family’, ‘secrets which can break a family apart’ and ‘becoming the person that others think you are’ were touched upon as well. This movie has 2 end credits scenes: one middle credits scene and one after credits scene. Both of them are interesting and they actually mean something. Finally, Marvel movie uses the end credits scenes to set something up as they used to do before, as opposed to Guardians’ end credits scene, which was just a funny Easter Egg. Anyway, the middle credits deal with Hope becoming the Wasp and taking up her mother’s mantel. I believe that they should have added this scene to the main part of the film, because it is really important for Hope’s character development. Throughout the whole movie, it is hinted that she will become the Wasp and everybody in the audience is hoping for it. Mainstream audiences might not wait for the end credits scene and, therefore, they cannot get any closure, so for them it seems that Hope’s character doesn’t get an ending to her story. The after credits scene is Marvel at it’s finest. We get to see Steve Rogers and Sam Wilson and DUN DUN DUN Bucky Barnes. Yes, the Winter Soldier has been caught! So, now we won’t have to spend any time looking for him in Cap 3 and we can get straight to the the Civil War story. Moreover, this scene solidifies the fact that Ant-Man will side with Captain America. All in all, I had a great time with Ant-Man. My dad really liked the film as well and he is not a die-hard Marvel fan, just a general movie goer. He has seen a few Marvel films, so he had a general knowledge of what he was getting himself into, but he still couldn’t understand all the references and he enjoyed the film nonetheless. I highly suggest you go see this movie for the great action, interesting and unique characters, a refreshing small scale story, funny jokes and Easter Eggs. If you are still not convinced, go see it just because it’s Marvel and Marvel never misses! Close off Phase 2 with Ant-Man an start the preparation for Phase 3.